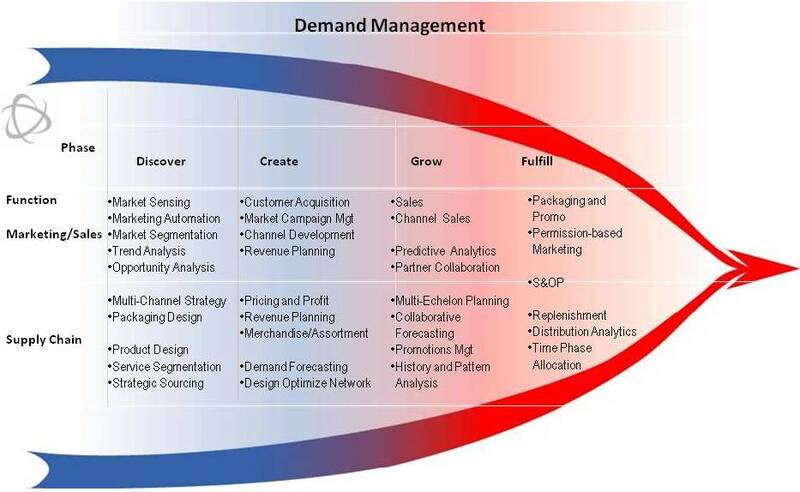 Companies that excel at Demand Management know how to predict and grow demand. They effectively segment their markets and channels. They analyze demographics and capture and analyze new audiences. They use price optimization and are smart about the use of promotions. They know when and how to do consensus and collaborative planning, and are able to effectively stay ahead of their competition by sensing and discovering Demand - new markets and new customers - by using web analytics and Marketing Automation. This is the 1st in the 3-part Structured series. For part 2 go HERE. For part 3 go HERE. The good news is that there are effective methods, both old and new, for understanding markets and customers with real insight: Marketing Automation, Demand Sensing capabilities, and yes, APS. As well, greater integration between Marketing and Supply Chain professionals is necessary to transform market data into effective supply chain strategies. 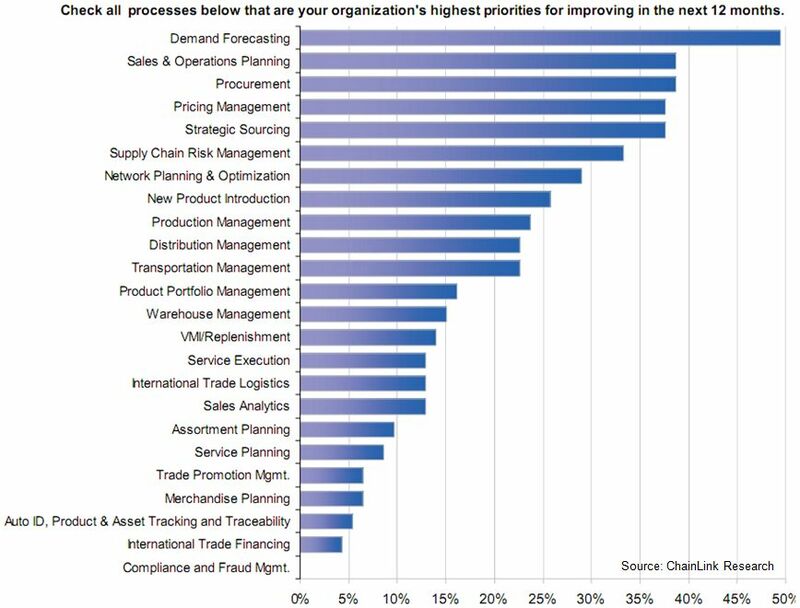 To get the 2010 Supply Chain Priorities Report go here. Forward-thinking companies have been able to rise above the crowd, not just in better forecasting, but across the whole process of generating, understanding, and fulfilling demand. We set out to explore those Demand Management practices that are already providing a competitive edge for their practitioners. Through our research, ChainLink has developed a framework to help practitioners understand and implement the elements of successful Demand Management (see Figure 2). For long-time ChainLink readers and customers, we updated this model from what you have seen before. This model is a "second decade" model based on our latest research from the last few years. There are new and enhanced methods, beyond aggregated demographic models, for discovering markets; and marketing automation technologies can provide new insights into customers' needs. We are dedicating the rest of this article to discovering markets, since this holds the key to getting new customers and business - don't we all want that! And this is also the least studied and systematically applied phase of Demand Management. Market Discovery is both the sensing of new audiences and the opportunity to create new markets. It includes the analytics required to determine product, price, profit, strategy and channel for our products in our chosen market. Demand Management excellence starts with discovering and sensing new audiences who can be turned into new customers. Market leaders excel at spotting opportunities. They are obsessive about understanding their markets and all of the forces at work that drive new demand. They pore over demographics and economic data, absorb the views of the pundits and experts, have healthy discussions, and then formulate their own unique and bold view of where the markets are heading. They are quick to experiment and seize opportunities. How do they do that? In creating and growing markets, it is essential to understand customers' needs, practical and emotional, latent and stated. Combing demographic data tells you that there are categories of buyers, but that is not the whole story. It does not tell you how they buy and what might be the next thing that captures their fancy. Are they Brooks Brothers types or do they prefer Zegna? Are they snowboarders or antique shoppers? What is the lifestyle that drives their spending? And will the loyal brand customer fly to a new channel based on economics (read Consumers Returning to Luxury Items), presentation or availability? Many firms have full-time economists tracking and predicting the next upturn or downturn. And they are always on the alert for the next disruption in their industry. In addition to absorbing quantitative and analytical information, leading companies really try to get into the mindset of their customers (the market psyche), creating valuable segmentation models and understanding trends that impact current or future behavior. Many companies are good at segmenting their products, but segmenting their markets is different. Sensing market behavior is critical to market leadership. There are structured methods, as well as a host of market research techniques, to gain this valuable data. Both structured and unstructured techniques are used to create market assumptions: what factors are affecting the overall market and market share; what drives sales; which items will be hot sellers, which will be dogs, and why. These market assumptions form the foundation of a firm's strategies for predicting and driving growth for the future. A good example is Nissan, that returned to growth through serving an underserved demographic. They found that underserviced demographic through both analytics and understanding tastes and trends. This is a topic most supply chain professionals don't think about. In fact, most organizations spend little time thinking through who their most desirable customer is, and how they can be reached: directly or through channels. As we discussed in previous articles. leading manufacturers who really want to find new audiences and convert them to customers are not satisfied with relying on their channel partners. So sensing and discovery are très important. "Indie Musicians Find New Audiences with Web Portals"
Segmentation models take simple data (such as demographic data and geo-demographic data) and overlay it with the psycho-demographic data (behavior elements). From there, the challenge is to delve into market motivations, trends, lifestyle, and channel preferences. All this has to be "cross footed" to the product, and the actual or perceived value/benefit of the product to the customer. This seems like a lot, but it points to the partnership required across the enterprise, especially between Marketing and Supply Chain. Here is How this Connects to Supply Chain Modeling: Segmentation of markets allows you to determine the value and price sensitivity of a customer or group of customers. By presenting the right-priced product offering to that segment, and also designing services specific to that group, you can increase profitability. And with great customer interaction and interactive tools, you can actually ask customers what they are willing to pay for, with either prepackaged or configurable elements. A model provided by Pepper and Rogers, Figure 3, is one type of model that provides context. Not all customers are equal. And not all customers are customers. You think they are, but they are not return buyers, and they are not sharing much of their wallet with you, either. 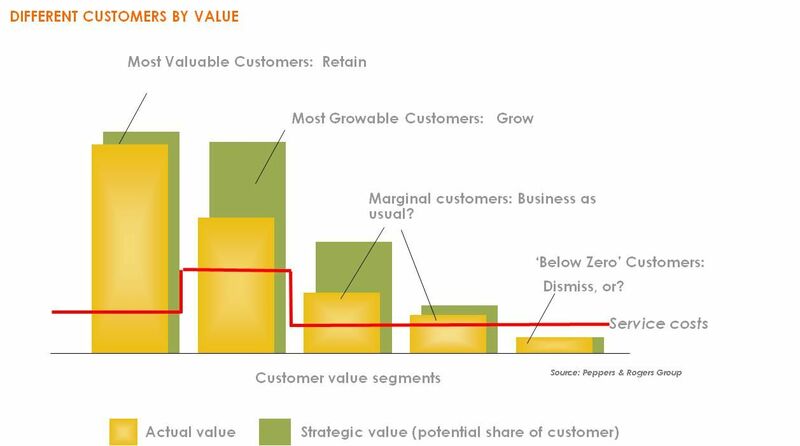 The segmentation analysis needs to include the value of each segment. See interview with Terry Vavra and Tim Keiningham of Loyalty Myths. Again, this approach creates a valuable one-two punch between Marketing and Supply Chain. Further, an integrated array of the analyses derived from customer opinion inputs, sales history, and product data can be modeled and discussed within the enterprise. Then, the right product offering, mix, and assortment by channel can be created. The insights gained can add huge value to firms that want to build customer loyalty, find new ways to build revenue, and successfully enter new markets. See also the 3-part Series of Demand Management the Strategic View.